There’s always the temptation to go for the cheaper universal option when shopping for automotive accessories. We can’t speak for all generic accessories online, but for those that are a cheaper and universal fitting option, you’re not going get the same level of protection, quality, and fitment you’d get from a seat cover that is specifically designed for you vehicle. There are many other factors that play into why custom pet seat covers are a better option for dog owners. In this article, we will be explaining a paw-full of benefits of custom dog seat covers comparing to other generic dog accessories. The first important difference between a universal product and a dog seat cover that’s custom-made for your vehicle is fitment. The one-size-fits-all selling feature might make it seem like a universal seat cover will work, but it probably won’t. Or, if it does, the overall fitment will be sloppy. Leaving areas loose, others tight, even some areas exposed. While buying a universal back seat cover might save you a few bucks at the beginning, the chances are you’ll have a few trips to the detail shop ahead of you. When discussing quality, we cannot speak for all dog car accessories out there, like dog hammocks or other generic doggy products. We’re not going to say they are all lesser quality. What can be said though is buying from a company that specializes in automotive grade, high quality custom car accessories means you’ll be getting what you pay for: a custom, high-quality product geared for automotive use. Not all companies use the same materials to make their universal seat covers (or custom seat covers for that matter). To ensure you’re getting a quality pet seat cover, it is best to do some research and compare products. You’ll find that some will stand out significantly compared to others. Think of it this way, if you buy a steak from a butcher shop, you’re far more likely to have a high quality piece of beef than if you were to purchase the steak from a big box grocery store. Yes, you pay a bit more, but that steak is going to be of a better quality -- not to mention taste better too. If that’s not the case, then we suggest going to a different butcher. Dog hammocks or generic dog seat covers have a tendency to move around and expose the seat. You can pull and tug and readjust all you want, but that little corner may always remain slightly exposed. That’s why some universal seat covers companies are now calling their dog seat covers “one-size-fits-most”. This type of selling tactic should warn you that you may just end up returning the product as it does not actually protect all seat types from all the dirt, hair, and mud properly. This is the main purpose for this type of product and crucial for dog parenthood. If your dog travels with you, large or small, you need a product that is going to stand up against all-things dog related. The most damage that occurs from a dog travelling with you is not necessarily dog hair which can be cleaned, but their nails. Be sure to read the material descriptions thoroughly to ensure that you’re getting a product that is abrasion resistant. These types of automotive fabric are extremely durable and stop your dogs claws from digging through, tearing or ripping the seat covers. This goes for both universal and custom products, but when you go cheaper, you’re likely not getting going to get as durable of a material. It can cost a bit more, but pays off when your dog is jumping in and out of the car constantly. Comfort may not be at the forefront of your mind when shopping for dog seat covers. But it is something that plays a role -- and maybe not in the way you think. Yes, we sell custom Sheepskin seat covers that are extremely comfortable. Yes, we have had customers buy them specifically for their dogs’ comfort as well. But that’s not exactly what we mean by comfort in this case. When you have a universal pet car product like a cover that goes over your seats and does not fit correctly, your dog might have a tough time while driving. The ill-fitting seat cover can bunch up, move around, fall off even. This can make it hard for your canine passenger to settle into a comfortable spot (even when wearing a seat belt). When you have a product that contours tightly to the seats and stays put, you don’t have to worry about it moving around. You don’t have to constantly look back to make sure your pup is lying down or your not-so-agile old timer is in distress clinging on for dear life as the seat covers move with every turn. Even some of the best universal fitting dog accessories will likely not fit as well as a one that is made specifically for your year, make, and model. It is just the nature of each product. Plain and simple. Opting for something that fit better means your dog's overall travelling comfort will be better too. This may go without saying, but an ill-fitting seat cover does not look good. If you spend a lot of time driving your car and your pets travel with you, this doesn’t mean you don’t care what you interior looks like. In fact, you probably care more. You are in it all the time! A cheaper dog accessory may at first fit well-enough, but as times goes on and your dog sits on it, you may notice that things start to stretch, fray or even tear (also another issue with quality sometimes). A sloppy fitting, stretched or torn seat cover can make your whole car look sloppy. If you want your car to look good for more than just a few trips, consider looking at custom car accessories. Ones that are geared for dog-use, but also offer products that actually look good in your car, truck or SUV. When shopping for pet seat covers, custom or not, you should always look for ones that are easy to clean. As a dog owner, you know what your dog is capable of. Whether it is a mud bath, an ocean swim, a roll around in a dusty field, whatever it is that your dog loves to do can end up in your car. You’ll want to be able to easily wipe down and vacuum the mess so you can keep your car looking great. Safety plays a role in determining whether to go with custom or universal seat covers. 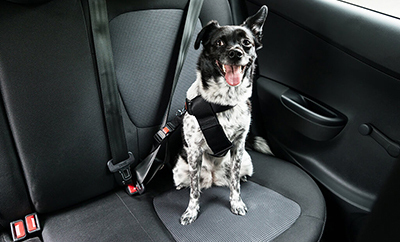 Just like any other passenger, you want your dog to be safe in the car. That’s why there are so many different car safety accessories out there too. 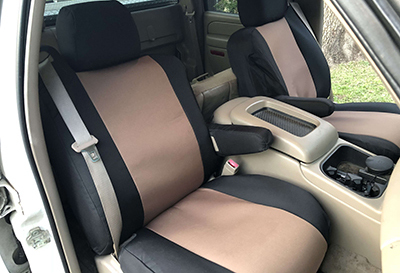 While we do not specialize in those, we can assure you that our pet seat covers are safe to install on your car seats and do not inhibit any safety features in your car (like side impact airbags). This may not be the case for all seat covers though. 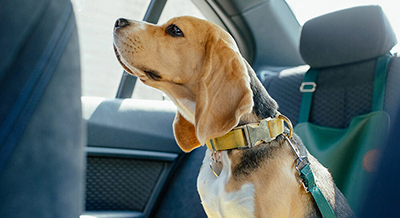 Our recommendation is always read the fine print or talk to a sales representative before purchasing if you’re concerned the universal seat covers may not be safe for you, your passengers, human or canine. We’ve discussed quality and fitment earlier on in this article and the shortcomings universal products have in this department. 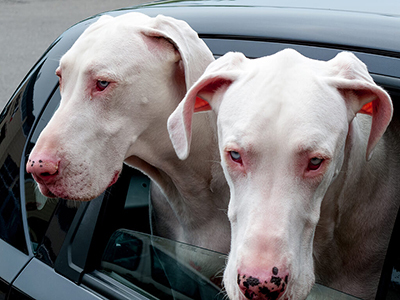 When these two crucial aspects of a dog car accessory are lacking, you should be aware of another drawback: longevity. 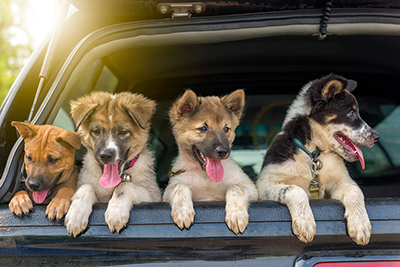 Having a dog travel with you on a regular basis is quite enjoyable, but it can also lead to extreme wear and tear of your car or truck interior. A dog seat cover is there to absorb that daily use and keep your original upholstery looking great and damage-free, maintaining the resale value of your car. However, if the quality and fitment is subpar, this can result in the seat covers themselves wearing faster. As a result, the damage to your original upholstery happens over time anyways or you’re forced to go out any purchase a new dog accessory (hopefully a better one). Purchasing a quality product means that they will likely last far longer. While you pay a little more upfront, it pays off in the end. In the long run, if you buy a cheaper, generic fitting seat cover, you could end up paying more not only because you have to buy something else, but repair of the upholstery may be needed. We’ve given you many reasons why buying custom dog seat covers over universal is a better option as a dog owner. Going cheaper may not be the best choice for you or your dog -- and sometimes universal dog accessories aren’t even that cheaper either. 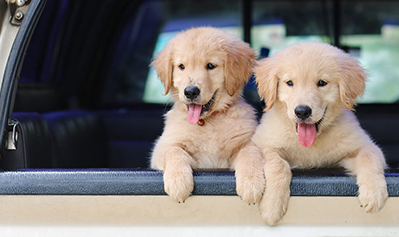 We highly recommend you read more about dog seat covers so that you feel like you’re getting what you need.